GMO Answers conducted a nationwide survey with the Opinion Research Council (ORC) to gather consumers' top ten questions related to GMOs. Below are those questions in order of interest, followed by the facts about genetically modified foods for each. 10. 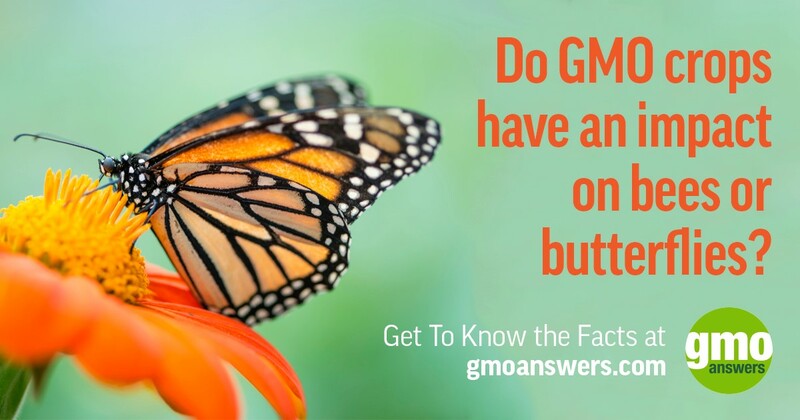 Do GMO crops have an impact on bees or butterflies? This is a big topic, so we are breaking the answer into two parts. First, let’s discuss bees. The sudden and widespread disappearances of adult honey bees from hives, termed Colony Collapse Disorder (CCD), became a national concern almost 10 years ago. Claims have been circulated that insect protected GM crops harm bees, but these assertions have been refuted by the mainstream scientific community. GMOs are not believed to have much of any impact on honey bee populations. EPA et al recognize the bee populations may be challenged by a number of factors including pests and parasites, microbial disease, inadequate diet and loss of genetic diversity. The insecticidal proteins produced by the currently available insect-resistant crops are derived from a common soil bacterium and all of the proteins used in insect-resistant GM plants are tested for toxicity to honey bees. None of these proteins have provided any evidence of harm in either short or long term testing with both adult and larval honey bees. • GMOs have any relation to what is happening with the bees? Answered by Chris Sansone, Global Regulatory Affairs Manager – Insect Resistance Management (Americas), Bayer. • Hearing about bee colonies dropping dead and the loss of nature’s natural pollinators at astonishing amounts is disturbing. Do you know if GM crops and there un-natural characteristics are influencing this? Are GM crops killing bees? Or the high amounts of chemical pesticides? Both? • Do neonicotinoids and Roundup affect the wild bee populations? If so, how are you working to stop this bee kill-off? Answered by Bill Reeves, Regulatory Policy & Scientific Affairs Manager, Chemistry, Monsanto Company. Now let’s explore the question in regards to butterflies. There are a variety of factors impacting monarch butterfly populations, such as deforestation, parasitism and ebbing populations of their host milkweed plants. There are claims that GMOs and herbicides (more specifically an herbicide called glyphosate) are contributing to the decline in milkweed – a primary food source for monarch larvae (caterpillars)— and that the butterflies have been harmed by eating pollen from GM Bt corn. GMO Answers experts address both of these claims. Dr. Andrew Kniss, associate professor of weed ecology and management at the University of Wyoming, explains why the cause for the milkweed decline is a complex issue, concluding that while herbicides may have played a role in the decline of species like milkweed, “the research does suggest that there are more important factors than herbicides responsible for the decline of native plant species near crop fields, including milkweeds.” This study he points to was conducted by USDA-ARS and Penn State scientists. What can be done? Shifting land management practices is one important factor affecting milkweed and other nectar plants that sustain monarchs. Researchers, conservation groups, government agencies and the agricultural community are identifying ways to reestablish functional habitat on the agricultural landscape while continuing to recognize the need for productive agricultural systems. Farmers have an important role to play in the conservation of monarch butterflies and can support a monarch recovery by helping to replenish milkweeds in rural areas. Similarly, everyone can support a monarch recovery by helping to establish butterfly gardens in urban and suburban areas. There are hundreds of these gardens that have been planted through efforts by groups such as Monarch Watch and the Monarch Joint Venture. It is important to note that before a genetically modified crop can be grown commercially, companies developing GM plants must demonstrate that the new plants are not harmful to “non-target” insects, such as bees and butterflies. This is part of the rigorous health and safety testing that GMOs must undergo before coming to market, which includes a mandatory review by the Environmental Protection Agency of GM plants that are insect resistant or herbicide tolerant to assess their environmental impact. This post by Steve Savage, discusses the extensive regulatory review process required for GMOs. • Are herbicides responsible for the decline in Monarch butterflies? Written by Andrew Kniss, Ph.D., Associate Professor of Weed Ecology & Management in the Department of Plant Sciences at the University of Wyoming. • If cross pollination does not occur, why the incident with milkweed occur thus killing off thousands of monarch butterflies? Answered by Eric Sachs, PhD., Environmental, Social and Economic Platform Lead, Monsanto Company. 9. Do seed companies have an influence on whether farmers grow GMOs? In another response, Brian goes on to say that “each farmer should have the freedom to farm how he or she chooses.” To see a real contract between a seed company and a farmer like Brian, visit Brian’s blog. • No, Farmers Don’t Want to Save Seeds. 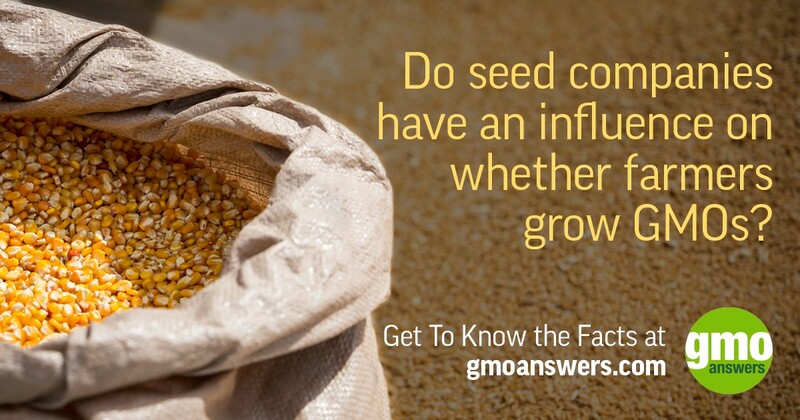 • Many farmers have chosen to avoid planting the GMO seeds, for whatever reason, and aren't given the choice to extract them once the seeds have infiltrated into their crops. Answered by Greg Wandrey, Ph.D., Former Director, Stewardship and Compliance, DuPont Pioneer. • From all the corporations combined including Monsanto how many law suits has there been on rural farmers? What exactly is the most common reason for the litigation? Answered by André Roef, U.S. Market Acceptance Manager, Bayer. 8. 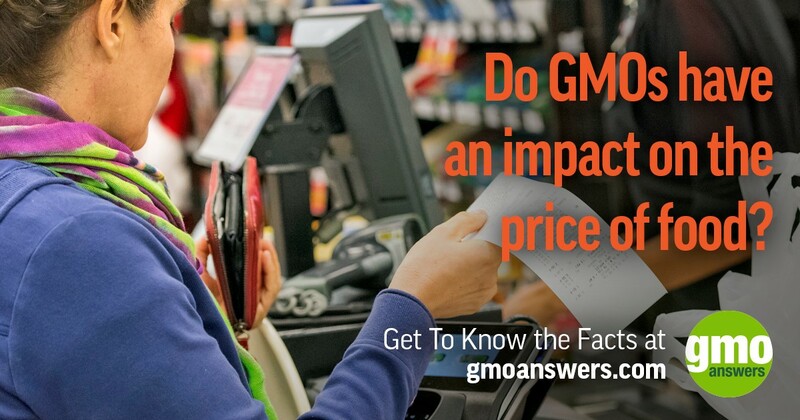 Do GMOs have an impact on the price of food? Food prices are affected by a number of factors, including commodity prices and by other costs, such as wages, transportation, in addition to losses due to weather, pests or disease. For example, foods that have to be shipped or hauled long distances will be affected when the cost of fuel rises. Without genetically modified crops, Zilberman also found, “the price of food would be 5 to 10 percent higher than it is now—particularly for meat, poultry, eggs, milk and processed food. ‘The poorest people will suffer the most,’” he says, adding that the cost will be borne mostly by people in developing countries, where many of these foods are already difficult to come by. In general terms, it is additionally important to recognize that the real price of food and feed products has fallen consistently during the last 50 years. This has come about not “out of the blue” but from enormous improvements in productivity by producers. These productivity improvements have risen from the adoption of new technologies and techniques, like GMOs. • If GMOs are the answer to the food shortages why do food prices keep going up? Answered by Dr. Stuart Smyth, Assistant Professor, Department of Bioresource Policy, Business and Economics, University of Saskatchewan. • Since all stages of GMO conventional agriculture heavily rely on petroleum, how will this affect the price of food and environmental pollution in the long term? Answered by Janet Carpenter, Owner, J E Carpenter Consulting LLC M.S. Agricultural and Resource Economics. • If there were no GMOs or chemicals in our food, would our food prices be lower or higher? 7. If livestock eat genetically modified grain, will there be GMOs in my meat? It has been estimated that over 70 percent of harvested GM crops are fed to food producing animals, making the world’s livestock populations the largest consumers of the current generation of GM crops. 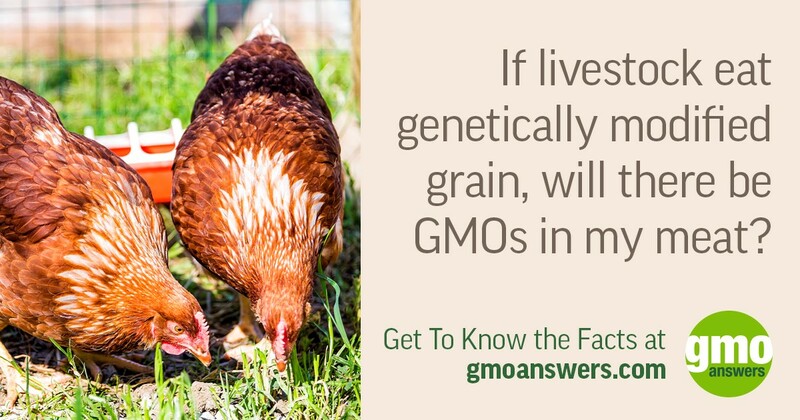 GMOs have never been detected in the milk, meat or eggs derived from animals fed GM feed. First, it’s important to understand that almost all the food that we (or animals) eat contains DNA and proteins. The DNA and proteins found in food, GMO and non-GMO, are processed by the digestive system in our gastrointestinal tract. During digestion, GMO and non-GMO DNA is broken down into the four nucleotides that make up all DNA, and/or into small nucleotide fragments. Similarly, proteins, again GMO and non-GMO, are broken down into one or a few of the 21 amino acids that exist in nature. Many studies have been conducted on the potential for GMO DNA or proteins to be transferred into animal tissue. No intact or immunologically reactive protein or DNA has been detected in animal tissue. Are feeds made from GMOs safe for livestock? GM crops, such as corn, soy and alfalfa, are commonly used for livestock, and more than 100 digestion and feeding studies have been conducted with food-producing animals, like beef cattle, swine, sheep, lactating dairy cows and chickens. Written by Roy Williams, retired dairy farmer and third-year graduate student in molecular and cellular biology at Dartmouth College. Answered by Gary Hartnell, Senior Fellow, Monsanto Company. • If a cow eats GMO corn or soy is there any way to tell or is there any difference in that animal’s meat or milk as opposed to an animal that consumed only organic feed? Answered by Bruce Chassy, Professor Emeritus of Food Safety and Nutritional Sciences, Department of Food Science and Human Nutrition, University of Illinois at Urbana-Champaign. 6. Do GMOs have an impact on allergies? It is important to remember that if a person is allergic to a non-GMO plant, he or she will also be allergic to the plant’s GMO counterpart. But GMOs do not introduce any new allergens. In fact, researchers, academics and companies are working on new GMOs that have the potential to help people in this area—for example, a team of Spanish scientists developed a gluten-free wheat that would be safe for people who suffer from celiac disease to enjoy. Before a GMO is created, the desired trait is screened against all known human allergens to confirm it does not introduce a new allergen. Check out this infographic to learn how researchers look at more than 1,950 genes to ensure quality and safety. 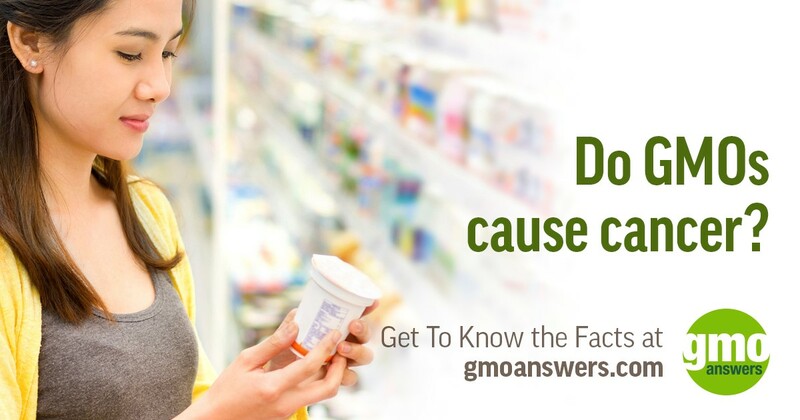 • What are the effects of GMOs on the human body? Has GMO foods led to an increase in the development of allergies among certain groups of people? Answered by Connie Diekman, MEd, RD, LD, FADA. • Is there good evidence that inserting genes of allergenic organisms into those that don’t normally contain them will not cause allergic reactions in people sensitive to specific allergens, e.g. soy? Answered by Lisa Katic, R.D., Principal, K Consulting. • Do you believe it valid to associate GM foods with the rise in food allergies, and if not then to what would you attribute the trend? For example, could cornsoy allergies be caused by the sheer quantity of cornsoy and their derivatives in our food, both GM and not? Answered by Jennifer Schmidt, Maryland Farmer and Registered Dietician. 5. Have long-term health studies been conducted on GMO crops? 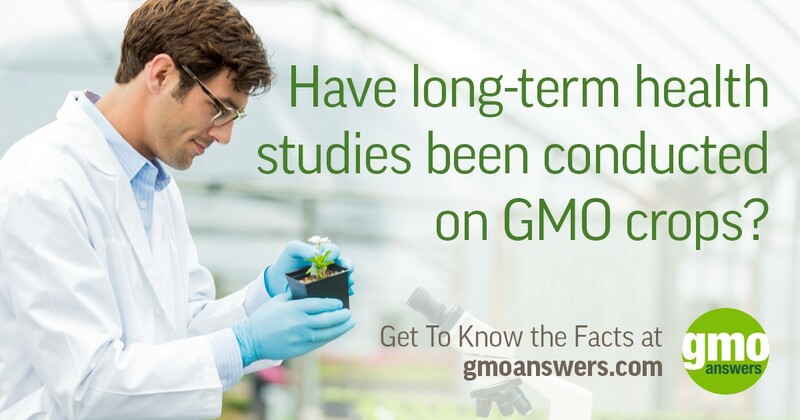 This might surprise you, but long-term health studies have been conducted on GMOs. Aside from the fact that GM foods have a long, safe track record (20 years in the marketplace), GM crops are repeatedly and extensively tested for consumer and environmental safety, and those tests are reviewed in the U.S. by the Department of Agriculture (USDA), Environmental Protection Agency (EPA) and Food and Drug Administration (FDA), and similar organizations internationally. Tests are conducted by both industry experts and independent organizations. An ongoing program called Project GRACE, publically funded by the European Union, has several objectives, including conducting 90-day animal feeding trials and animal studies with an extended time frame. The scientists involved with this project recently published a 1-year feeding trial with GM maize MON810 variety and conventional maize varieties. The results obtained show that the MON810 maize at a level of up to 33 percent in the diet did not induce adverse effects in rats after a chronic exposure. In fact, every major scientific body and regulatory agency in the world has reviewed the research about GMOs and openly declared crop biotechnology and the foods currently available for sale to be safe. • How can you be sure that GMO foods won’t affect human health long-term? Answered by Denneal Jamison-McClung, Ph.D., Associate Director, UC Davis Biotechnology Program. • Are GMOs tested beyond 90 days by the agro companies? Meaning, do you report data on test conducted beyond 90 days? Answered by Bryan Delaney, Ph.D., Research Fellow, DuPont Pioneer. • Are there any long term (30+ years) studies done on the full spectrum ecological impact of transgenic GMO organisms? Answered by Bruce M. Chassy, Professor Emeritus of Food Safety and Nutritional Sciences, Department of Food Science and Human Nutrition, University of Illinois at Urbana-Champaign. 4. 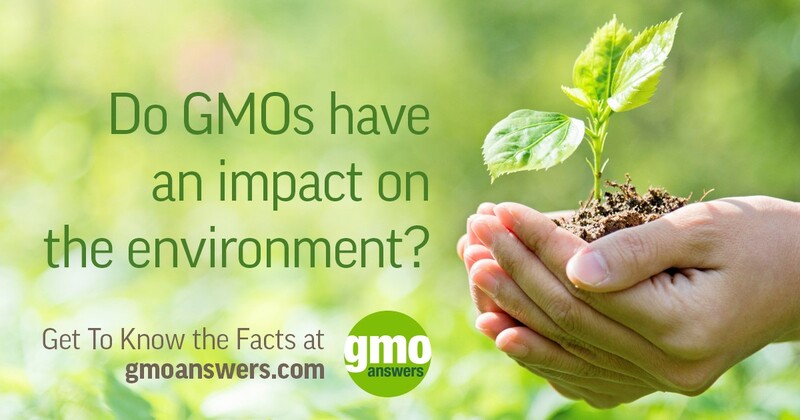 Do GMOs have an impact on the environment? To start, GMOs in agriculture can preserve biodiversity. GM crops increase productivity on existing agricultural land and protect biodiversity by sparing lands not intensively cultivated. Through enhanced adoption of conservation tillage practices, the reduction of insecticide use, and the use of more environmentally benign herbicides that increase yields, GM agriculture has alleviated pressure to convert additional land into agricultural use. GMOs can increase productivity in agriculture. According to PG Economics, from 1996 to 2014, GM crops are estimated to have contributed to an additional global production of 354.7 million tons of maize, 174.6 million tons of soybeans, 27.2 million tons of cotton and 10.1 million tons of canola. GM crops have contributed to higher yields, e.g., 30 percent more in some farming areas, and can contribute to poverty reduction and food security in developing countries. GMOs can reduce soil erosion. Herbicide tolerant (HT) crops enable more farmers to adopt conservation tillage because they help farmers to more effectively and efficiently control weeds at a lower cost. Florida farmer Lawson Mozley explains that with herbicide tolerant GM crops, weeds can be sprayed and remain in the field to protect the soil. Then the incoming crop is planted directly into the leftover organic matter without turning over the soil. GMOs can help conserve water. Farmers utilize many tools to conserve water including drip irrigation systems. GMOs provide another tool that farmers can employ to help conserve water. HT crops, along with conservation tillage, aid in soil moisture retention, which can reduce the need to irrigate. GMOs can help reduce water use in another way – drought tolerance. This GM trait can help crops cope with stress and allow farmers to increase yields when periods of drought occur – without supplemental water from irrigation. GMOs can lead to fewer pesticide applications. A common misconception is that the adoption of GM crops have increased the use of pesticides, when just the opposite is true. Overall GM crops, including crops with the “Bt” (Bacillus thuringiensis) trait for insect resistance, have contributed to a 37 percent decrease in pesticide applications. Not only is this beneficial to our environment, but also to the farmers who grow the crops. Learn more about how some GMOs have led to the reduction in pesticide applications here. Although GMOs can mean fewer pesticide applications in some crops, it is important to remember that pesticides play an important role in a healthy production system. In this article, Walter DeJong, a plant breeder and geneticist with Cornell University, discusses how both pesticides and GM crops can help make agricultural production more efficient, especially in developing countries. What does the future hold? In addition to the number of traits being developed to address weeds, destructive pests and diseases, drought-tolerance, saline-tolerance and nitrogen uptake, there are many examples of nutrient-enhanced staple crops under development in developing nations in Africa and Asia. Examples include bananas, cowpea, and cassava. Many people working in biotechnology are focused on the potential benefits of GMO technology and all that it can do to address complex challenges around the globe. In order to address these challenges, particularly in the developing world, efforts are focused on improving food availability and nutrition; providing farmers with improved tools to enable better use of their land, water and labor resources; and helping local farmers move beyond subsistence. • What are the real economic and environmental impacts of GM crop use? Answered by Graham Brookes, Agricultural Economist and Independent Expert. • Regardless of the safety of chemicals being sprayed on food crops, what are the effects to the environment and communities who are surrounded by chemical seed companies who spray pesticides around the clock? Answered by Steve Savage, Consultant, Savage & Associates. • Do GMOs Risk “Unintended” Health or Environmental Consequences, as Critics Maintain? Answered by GMO Answers Community Manager. 3. How much of our food in the U.S. is genetically modified? While nearly all foods today have been genetically modified in some way over thousands of years through selective breeding, there are only nine commercially available GM crops in the U.S.: soybeans, corn (field and sweet), canola, cotton, alfalfa, sugar beets, summer squash, papaya and potatoes. GM apples have also been approved to be grown and will be coming to market soon. This chart explains why each of the nine GM crops – which are commercially available today – are genetically modified. The majority of these crops, like alfalfa, field corn and soy are actually used for livestock feed. Other uses for these crops include common food ingredients, such as sugar, canola oil, corn starch and soy lecithin. You may find only a few of these in your produce section: rainbow papaya, summer squash, sweet corn and potatoes. The GM AquAdvantage salmon is the first GM food animal to be approved by the FDA. The salmon was genetically modified to grow to market weight faster, utilize less feed and conserve wild fish populations. Read more about this first GM animal, why and how it was created here. • How many GMOs do we eat daily? Answered by Andy Hedgecock, Former Director, Scientific Affairs, DuPont Pioneer. • Do you think that genetically modified crops will help to feed the world and solve world hunger, or are they merely tools adopted by wealthy countries to monopolize the food market? • When were GMOs first introduced to the food supply? 2. Are GMOs safe for human consumption? Yes, GMOs are safe. Many consumers are led to believe that GMOs can cause cancer, autism, gluten intolerance and other illnesses. However, this couldn’t be further from the truth. Every leading health organization in the world stands behind the safety of GMOs. Extensive studies on GMOs are being conducted to ensure their ongoing safety for consumption. 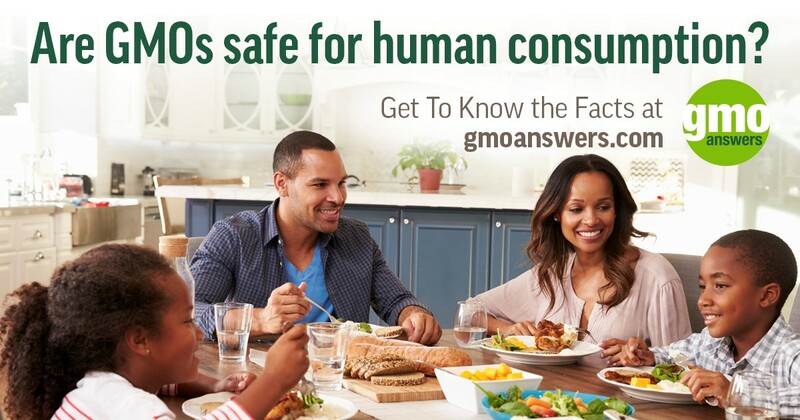 Click here to find thousands of studies on the safety of GMOs. Click here to find hundreds of independent studies. This infographic details how more than 20 scientists, researchers, agricultural and industry experts reviewed more than 20 years of data since GMOs were introduced, including nearly 900 studies and publications, animal studies, allergenicity testing and North American and European health data. • Why is it that research is showing that since GMOs have been introduced into our foods that people are becoming ill and are now developing illnesses that will or can kill them in the long run? Answered by Catherine Feuillet, Head of Trait Research, Bayer. • How are GMO affecting small children, and/or adults in America? Answered by Kevin Folta, Professor and Chairman, Horticultural Science Department, University of Florida. • Could you tell me about GMOs’ effect on human beings overall health and longevity? Answered by Scott Kohne, NAFTA Market Acceptance Manager, Seeds Unit, Bayer LP. 1. Do GMOs cause cancer? 1. Do GMOs cause cancer? This is an important question. Numerous questions like this and related topics have been submitted to GMO Answers, including questions about reports claiming that glyphosate causes breast cancer and about a Séralini study (now retracted) claiming GMOs caused cancer in rats, among others. We know that consumers have concerns, so we reached out to Dr. Kevin Folta, University of Florida interim chairman and associate professor, horticultural sciences department, for an answer. “The short answer is no, there is absolutely zero reputable evidence that GMO foods cause cancer,” he writes. You can read Kevin Folta's full response to the question “Do GMOs cause cancer?” here. Additionally, the health and safety of GMOs have been validated by many independent scientists and organizations around the world. For example, there are nearly 1,800 global studies about the health and safety of GMOs, and a decade of GMO research, funded by the European Union, which finds that GMOs pose no greater risk than their conventional counterparts. This report can be found here. 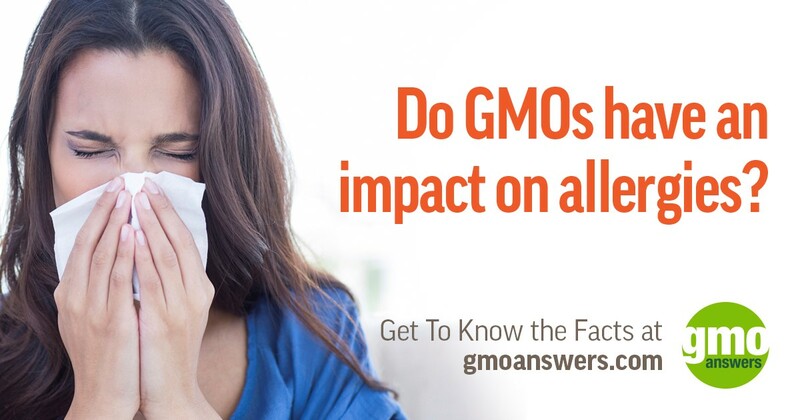 There are also multiple resources (links below) that explore this topic on GMO Answers. • Will I get cancer? 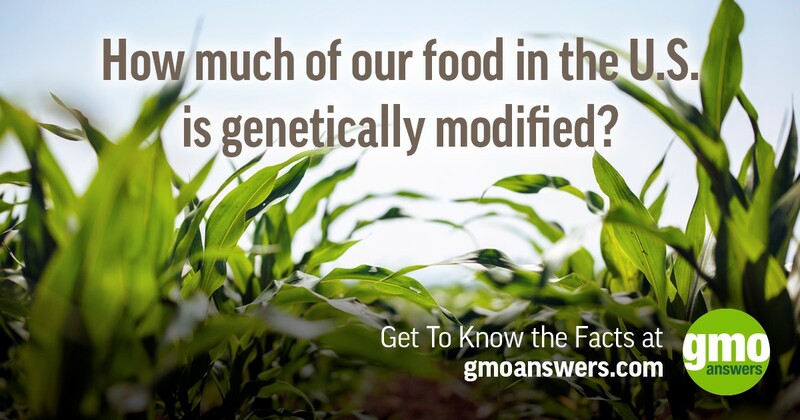 Answered by Dan Goldstein Senior Science Fellow and Lead, Medical Sciences and Outreach, Monsanto Company. • How can you say that [GMOs] are safe, when recent studies (not conducted by Monsanto) show a direct link to breast cancer from glyphosate? Answered by John Swarthout, Ph.D., Scientific Outreach and Issues Management Lead, Monsanto Company. • Is the debate about health and safety and GMO truly unbiased?